Note: The following appears in the Appalachian State gameday football program. To purchase a copy of the program while supplies last, send a check for $6 to Clemson Athletic Communications; P.O. Box 31; Clemson, S.C. 29633 with your return address. The most pleasant offseasons for Clemson fans are ones after the Tigers beat rival South Carolina in the final regular-season game, then win a bowl game. When the Tigers defeated Oklahoma in the Russell Athletic Bowl in December to cap a 10-3 season, it marked the first time since 2005 the Tigers ended the year with wins over the Gamecocks and a bowl opponent. That 2005 season concluded with a 13-9 win over South Carolina in Columbia and a 19-10 victory over Colorado in the Champs Sports Bowl, which is now sponsored by Russell Athletic. So, not only was the 2014 accomplishment the first since 2005, both teams concluded the accomplishment with bowl victories in the same Florida venue. The 2005 team is celebrating its 10-year reunion today at Memorial Stadium, and there is much to celebrate. When looking back at the last 10 years of Clemson football, there have been eight seasons of 8+ wins and seven seasons that have ended with a top-25 ranking. That stretch of excellence all started with the 2005 season. The year started in exciting fashion with a 25-24 win over No. 17 Texas A&M, who had not been to Clemson since 1973. It was an odd game in many respects in that Clemson scored 25 points, but did not score an offensive touchdown. Chansi Stuckey returned a punt 47 yards for a touchdown in the second quarter to give Clemson the lead and Jad Dean made a school-record six field goals, including a 42-yarder with just two seconds left to win the game. The nationally televised game proved to be a great debut for James Davis, who rushed for 101 yards, the first Tiger first-year freshman to rush for 100 yards in his first game since the 1945 season. Clemson then defeated Maryland 28-24. Reggie Merriweather scored two touchdowns, including the game-winner on a 38-yard run with 2:58 left. At 2-0, No. 13 Miami (Fla.) came to town for a meeting with No. 20 Clemson. This proved to be one of great games in the Memorial Stadium history and is still the longest game the Tigers have played. The two teams battled for three overtimes before the Hurricanes prevailed 36-30. What followed were two more close games, a 16-13 overtime loss to Boston College and a 31-27 loss at Wake Forest. The season hung in the balance as the 2-3 Tigers traveled to NC State for a Thursday night game. Davis put the Tigers on his back with 143 rushing yards and two touchdowns before breaking a wrist, and the Tiger defense held the Wolfpack to just one touchdown and 10 points. It was the first win in a streak of six victories in the last seven games to end the season. The only loss was a 10-9 setback at Georgia Tech on October 29, Clemson’s fourth loss by six points or less, including two in overtime. After a 49-20 win over Duke when Will Proctor came off the bench for an injured Charlie Whitehurst to total 201 passing yards and two touchdowns, the Tigers defeated eventual ACC champion Florida State 35-14 on November 12. Playing in his final home game, Whitehurst was superb, completing 21-32 passes for 269 yards and three touchdowns. Stuckey had 11 receptions for 156 yards and two touchdowns, as Clemson dominated the third quarter (21-0). 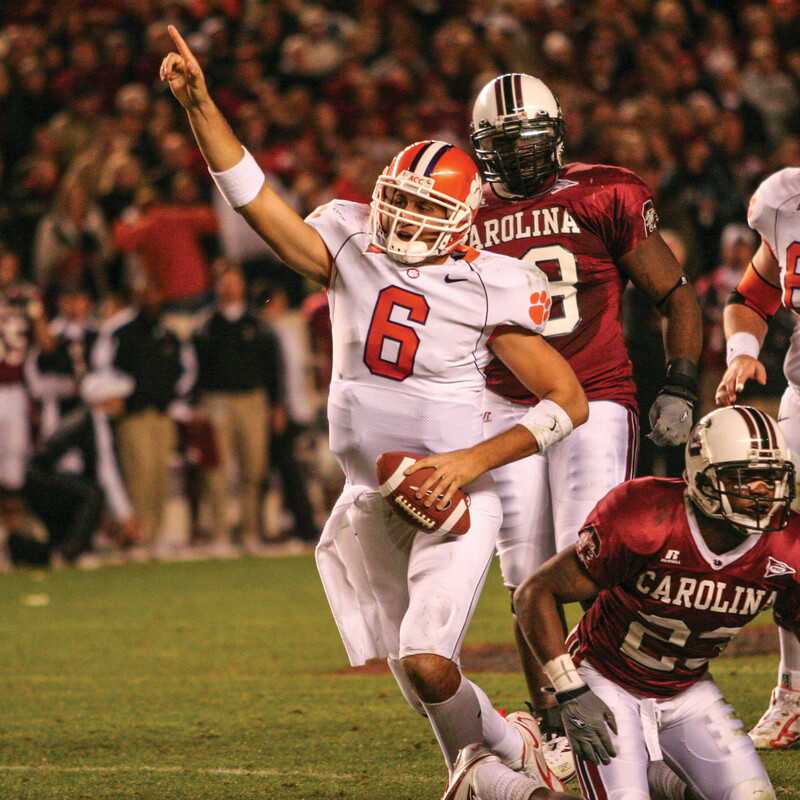 Clemson closed the regular season with a 13-9 win at South Carolina, making Whitehurst the first and still only player in the history of the series to start and win four games at quarterback in the Clemson vs. South Carolina rivalry. The now longtime NFL veteran iced the game with a 10-yard run on a draw to allow Clemson to run out the clock. The win over Colorado in the bowl game was certainly earned. Davis was the MVP with 150 rushing yards. Whitehurst, playing in his final game as a Tiger, was efficient by going 21-29 for 205 yards. It was his 25th win as Clemson’s starting quarterback.